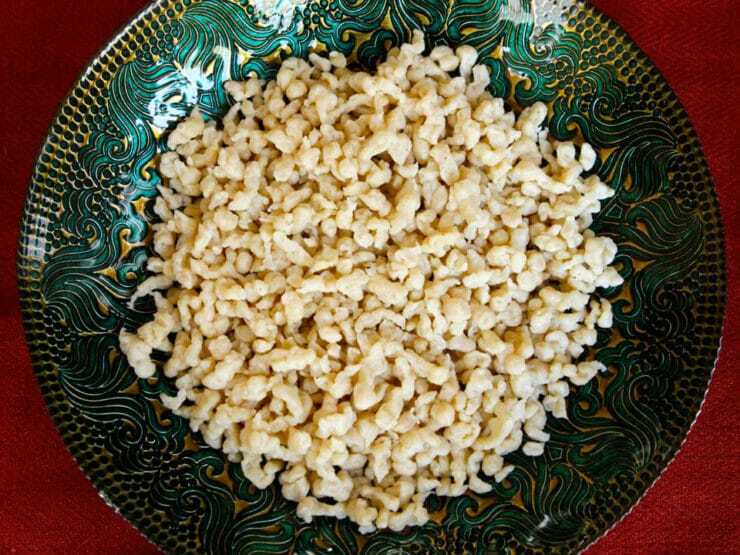 When meeting with my friend Michael Berkowits recently, he served me his favorite recipe for Chicken Paprikash over small egg noodle dumplings known as nokedli (in some regions they are called spätzle). Michael grew up in Transylvania (what is now the central part of Romania, and was once part of Hungary). 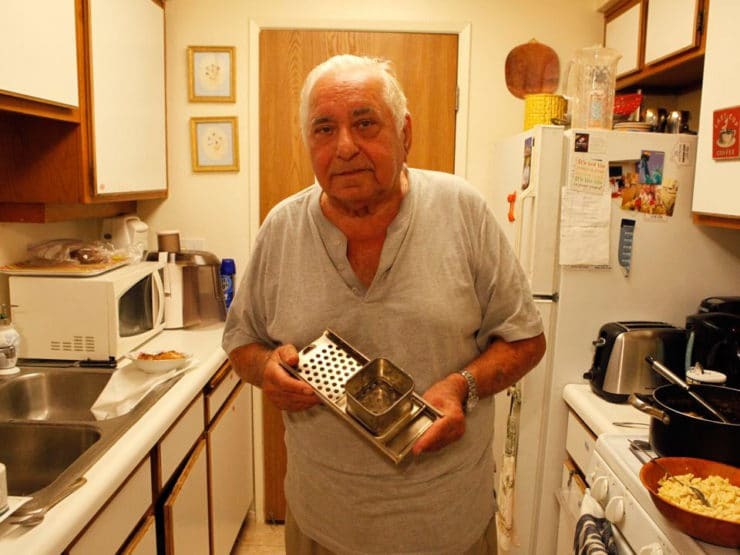 Because of his background, many of his family recipes have a Hungarian influence. These dumplings are a popular and beloved starch in many Eastern European countries. They are surprisingly easy to make and very tasty. As Michael described how to make the dumplings, he showed me an old kitchen tool he’s had for close to 50 years– he called it a “nokedli maker.” It is more widely known as a spätzle maker. This tool is used for pushing the nokedli batter into the boiling water. I didn’t have one at home, so I used a metal cheese grater, which worked well. I recommend using a grater or spätzle maker (which I just ordered!) rather than the alternative method of spooning small amounts of batter into the boiling water, which takes a lot of time and can produced overcooked nokedli if you’re not careful. Michael’s instructions were kind of vague on the nokedli– make a batter of 2 cups of flour, 2 eggs, water and salt, then boil in salted water. After some experimentation, I found that the following combination worked best and produced the same texture of nokedli that he served me at his home. I find them very tasty and homey, a comforting dish that can be made in 15 minutes or less. Try them fried in butter and topped with parsley, or serve them with your favorite stew or a saucy braised dish. Enjoy! 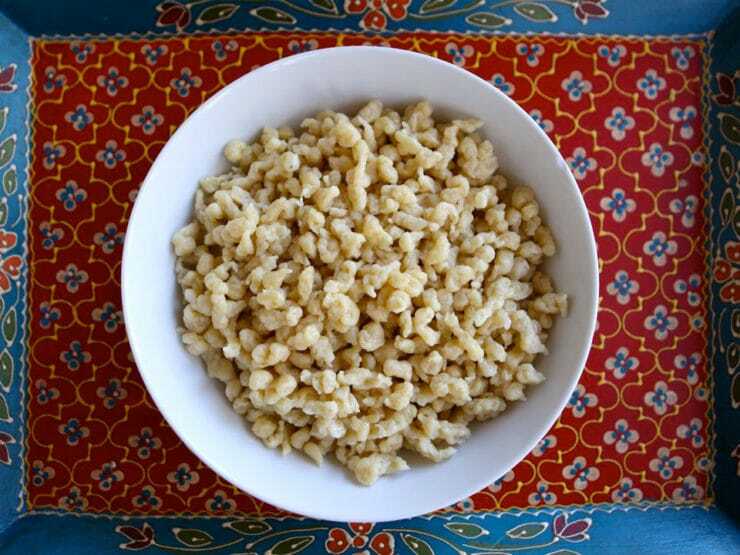 An easy step-by-step tutorial for making nokedli, also known as spätzle- small Eastern European egg noodle dumplings. Bring a large pot of well salted water to a boil. Beat the eggs and tepid water together with the salt. 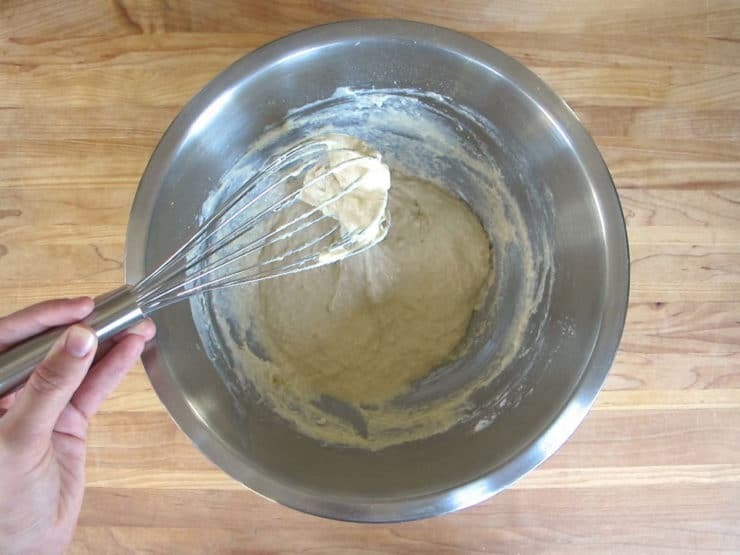 Slowly beat in the flour 1/4 cupful at a time to make a soft, sticky dough (you may not need all the flour, or you may need more-- stop adding flour when the texture of the batter is soft and pliable). Let the mixture rest for 10 minutes. Beat the mixture again. 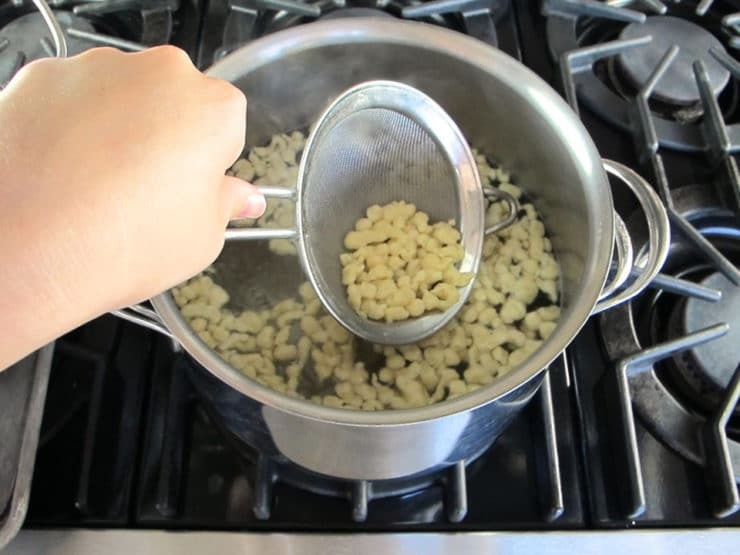 Push 1/3 of the batter through a spaetzle maker, cheese grater or pasta strainer over the pot of salted water to create small egg noodle bits that drop into the boiling water. Let the noodles cook for about 3 minutes until they float to the top of the pot and are cooked tender all the way through. 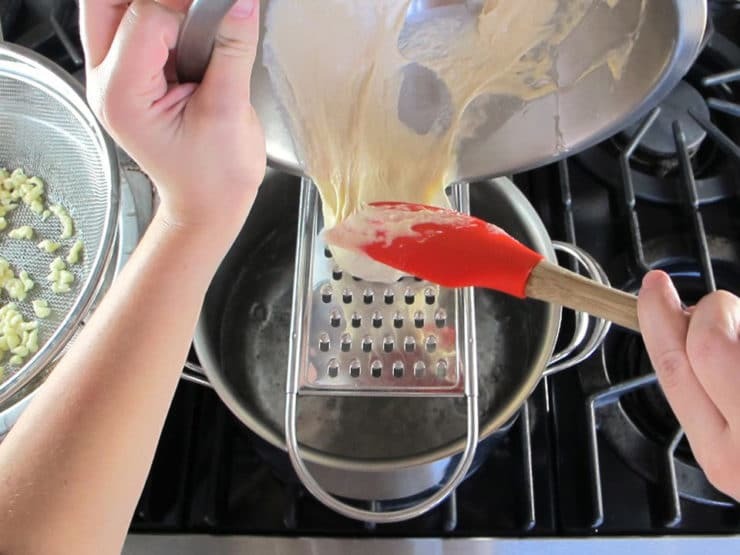 Remove from water with a slotted spoon or small mesh strainer and drain in a colander. 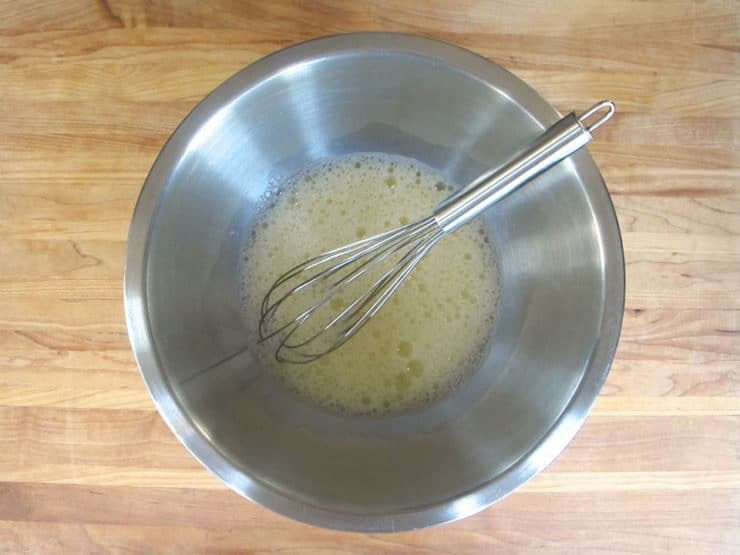 Repeat the process two more times with the remaining two thirds of the batter. Serve warm. You can toss them in melted butter, fry them a bit, and sprinkle with fresh parsley (this would make it a dairy dish). Or, you can serve them with your favorite Hungarian-style stew or dish. Goes great with chicken paprikash. I’m Slovak and my mother made these with chicken paprikash also. She also used a flat plate and a spoon to flip them into the boiling water. They were considerably larger than the spatzle. She also used them with fried sauerkraut or chopped cabbage browned in butter. I’m making them with sauerkraut tonight. MY HUNGARIAN GRANDMOTHER, WHO DIDN’T SPEAK A WORD OF ENGLISH, USED TO MAKE CHICKEN PAPRIKASH WITH NOKEDLI. SHE USED TO MAKE QUITE A BIT OF DOUGH AND USED THE BACK OF A TABLESPOON TO FLICK IT INTO A LARGE POT OF BOILING WATER AT LIGHTNING SPEED. SHE WAS SIMPLY INCREDIBLE AND HER CHICKEN PAPIKASH WITH NOKEDLI WAS ABSOLUTELY THE BEST!! 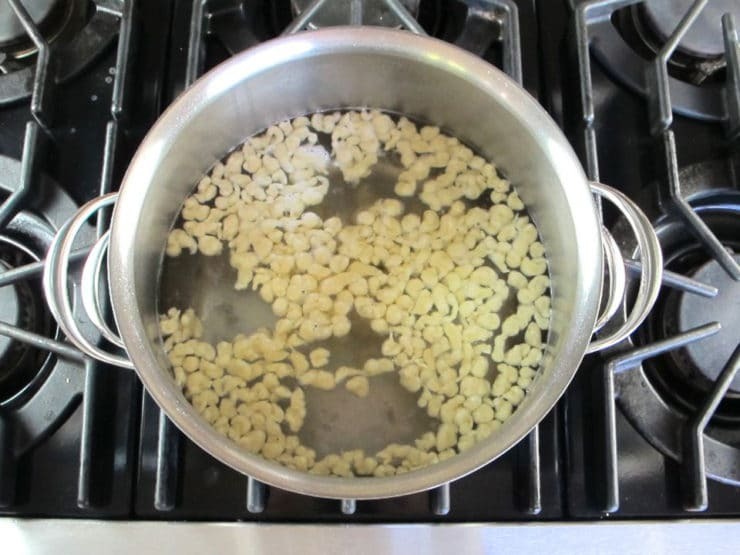 I MAKE IT NOW AND THEN FOR MY WIFE AND KIDS (WHO ARE NOW GROWN UP), ONLY I TAKE A SHORT CUT AND USE FROZEN CAVATELLI. IT’S GOOD, BUT NOT AS GOOD AS GRANDMA’S. 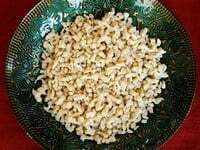 THANK YOU FOR RECIPE FOR NOKEDLI. I WILL TRY TO MASTER IT. Our Hungarian family used to go to a restaurant called Budapest Restaurant in Toledo, Ohio, which has since closed. They served the Nokedli with many dishes, including their stuffed cabbage which was the best ever. On top of the Nokedli, they put a kind of sauce or gravy. It was white and may have had some paprika in it. Do you know of anything like this? I know just the place you are talking about. I grew up in Toledo, have been to the Budapest Restaurant and absolutely loved their food. I lived close to Tony Packo’s Restaurant, and went to HS with young Tony. I would also love that gravy recipe. Are you sure it wasn’t the Paprikash gravy? My father used to make this regularly and in a big pot, well, with 6 kids it had to be big. I used to watch him make the mix then put some on a flat plate, then using a tablespoon upside down he used to keep the tablespoon hot and wet and flick, off the edge of the plate, lumps of the mix into the hot boiling water, the knokadli pieces were a little larger maybe, than those shown here, but added to the chicken, green peppers, tomato, mushroom, grated carrot, olive oil, paprika, salt&black pepper (onion if you weren’t allergic, I was) it made a grat hearty meal,bwhich I now cook for friends on occasssion. OMGoodness! My fav dinner from the Ornstein family in Cinti Oh in 1967! Loved you kids! Sana, while I haven’t tested it myself I don’t see any reason why it shouldn’t work. these came out great ! I fried them a bit in olive oil. thank you sharing such great recipes ( including kosher chicken paprikash). love and prayers from your fan in pakistan. Thanks for the Nokedi recipe. I forgot how my grandmother made them but chicken paprikash I have memorized having helped her make it as a young…skinny child. My Hungarian grandmother used to make these and put them in soups as well. She didn’t use a grater. She put the flour mixture on a small, flat plate and used a butter knife to separate a ribbon of flour. She then used the knife to cut small pieces and push it in the water with the knife. She did it so fast I just loved watching it. She made her own noodles for chicken soup on a large cutting board. She used a machete to cut the thinnest noodles you’ve ever seen and at the speed of light. Ferenc, kosher Jews do not mix dairy products with meat. This is a Hungarian Jewish recipe, which is why there is no sour cream in the sauce. It is traditional, but only for Jewish Hungarians, not for all Hungarians. Do the same method for beef, pork lamb. Excellent recipes. I made the chicken and the spaetzle last night. Took some time, but it was easy to follow. Like I do with all slow cooked foods, I make them the night before. Be sure to use good paprika, I think that is the key. There are only two of us and I made the whole recipe. I will make individual portions with my FoodSaver and freeze them for future dinners. I never really liked paprikash with sour cream. This recipe is much tastier and less Jewish guilt! Thanks for sharing Michael’s heart rendering story. Glad you enjoyed them Nina! How different do you think the recipe has to be to make it with whole wheat flour? I, too, remember this dish very fondly from my childhood (my mother, z”l, was a fabulous Hungarian cook) but these days I’m pretty committed to whole grains. Hi Tammy– yes you can, they reheat quite well. Just stir them in a pan over medium heat with a little butter or olive oil to keep them from sticking. This is soo Great to find such delightful cooks! I find that if, after you boil them, you put in a fying pan with some butter, and get the outsides a little crunchy, they’re even better!